At Snoqualmie Pass, the rugged North Cascades begin to soften. Older and more weathered, the West Cascades form part of the Cascade-Sierra mountain range that runs the length of the United States. The West Cascades are a glaciated landscape with numerous river valleys. At the heights, peaks approach 7,000 feet. Much taller stratovolcanoes— Mount Rainier, Mount Saint Helens, Mount Adams in the East Cascades, and Mount Hood in Oregon dramatically punctuate the ecoregion. 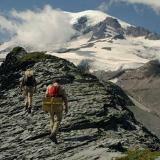 Mount Rainier tops them all at more than 14,000 feet. These volcanic peaks are part of the intercontinental Ring of Fire that rims the Pacific Ocean. They vary in activity, ranging from long dormant to increasingly lively. The eruption of Mount Saint Helens in 1980 blew out a tremendous plume of ash and reshaped its surrounding landscape. The Columbia River, at some fifty feet above sea level, bisects the Cascades. The gorge developed at roughly the same time the Cascades began to uplift. The gorge itself was shaped by cataclysmic floods caused by the breakup of Glacial Lake Missoula. For details of this ecoregion within Washington, click a subheading in the left column.